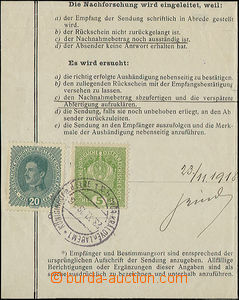 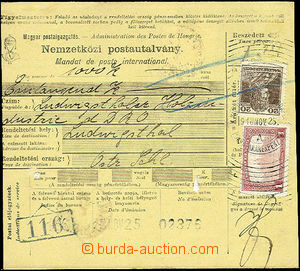 1919 firm letter sent from Cracow to Trinec, postage due 10h, the fee was paid with provisional of Polish stamp with overprint "PORTO" 10h + 15h, mailing daily postmark Cracow 16.X.19 (incomplete imprint), arrival daily postmark Trzyniec 17.X.19, no damage, unique! 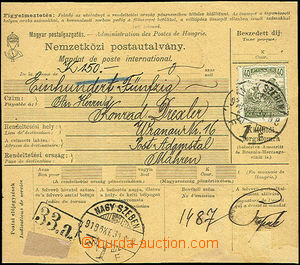 Pof.1-26, complete set of bocks of four imperforated, included 10;20;30; Pof.6N with bottom margin; Pof.9N, Pof.13N, Pof.26a, values 15h, 18h, 100h a 300h also with margines, higher value pieces expetised by Gilbert., Karasek., Benes, all post office fresh MNH original gum!!!! 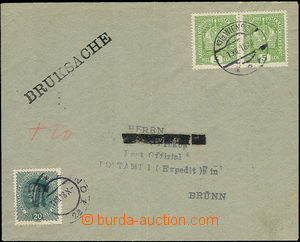 Pof.2Ms, two same facing 2 post stamp gutters valued 3h violet in block with significant fold between post stamps, minimal price 36000,-Kč, rare offer!